Nuclear medicine, or molecular imaging, is a modality that gives doctors a view of physiology instead of anatomy – how the body is working instead of what the body looks like. This difference is significant because the body may sometimes look normal while it acts, or feels, abnormal. Medicines called radiopharmaceuticals are what make nuclear medicine work. 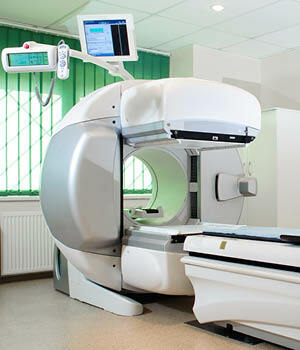 They are used to direct a small amount of the least harmful type of radiation at a specific organ. A machine called a gamma camera records the movements of this process in real time, and those images show the function of that organ. We also perform more advanced studies if they are requested by your doctor. These include the Thyrogen study (a 4 day process) that can locate ectopic (abnormally located) thyroid tissue, or metastatic thyroid cancer tissue. It is used as a follow up to thyroid cancer treatment. An Indium labeled white blood cell scan is a fantastic piece of imaging that involves drawing blood, separating the white blood cells out, tagging them with a tiny amount of radiation, and then re-injecting them. Afterwards, the gamma camera tracks those white blood cells as they move through the body. This is helpful in evaluating fevers of unknown origin, and several types of infections. After your exam your doctor will be able to review the test results. For more information and to schedule a Nuclear Medicine exam please call 541.667.3520.